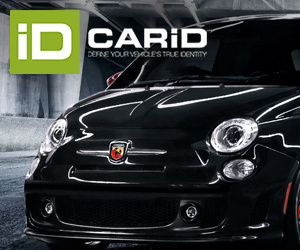 Brazil faces tough times, and Fiat and most of the carmakers operating there know it. Last year total sales dropped almost 2% due to macroeconomic problems, uncertainty about the future and more taxes. FCA continues to lead. However competition gets tough. Here are the main insights for 2013. 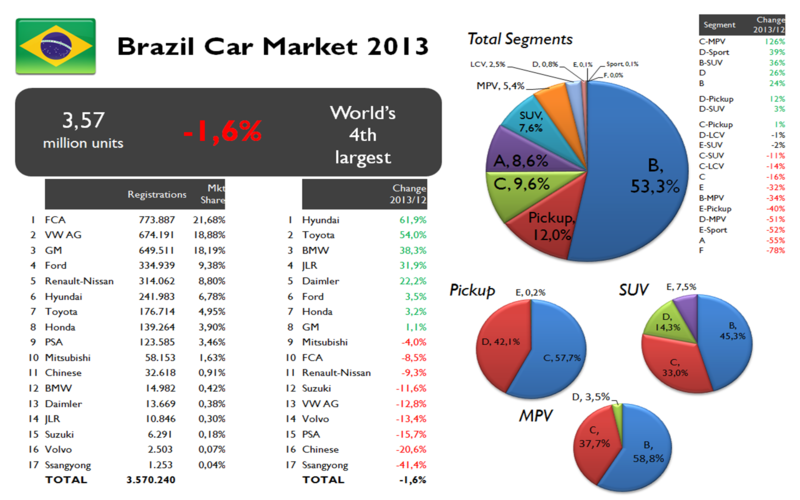 Brazil is still the world’s fourth largest car market despite its negative growth last year. FCA leads with more than 20% market share. Thanks to the HB20 and the Etios, Hyundai and Toyota were the big winners in 2013. PSA and VW had big loses. FCA sales, mostly from Fiat brand, fell 8,5%, more than overall market. That’s how its market share dropped almost 2 basic points. 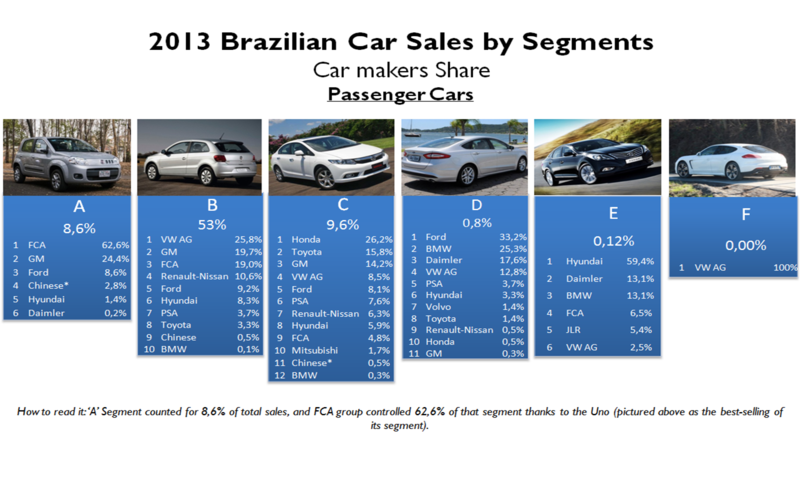 Brazil is FCA’s second largest market by volume. 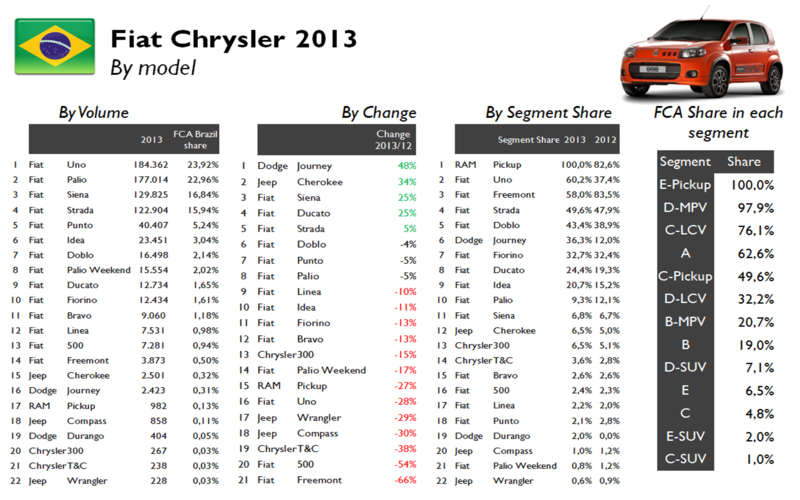 Chrysler brands are still very unpopular, while Alfa Romeo isn’t available yet. Following the market’s trend, almost half of FCA’s sales come from B-Segment: Palio family mostly. Only a small part of the group’s sales come from larger segments. Notice that C-Segment counts for 2,1% of the sales and both products, the Linea and Bravo are locally built. The group sales dropped because of the big fall on A-Segment (Uno), as the B-Segment and Pickups posted positive changes. The Uno occupied the pole position for only 7 thousand units more than the Palio. The big winners were the Siena and Strada in opposite to the big fall of the Freemont and Uno. FCA is strong in the pickup and MPV segments. It controls 63% of the city-car segment. Notice how small is its share in the compact-SUV segment and C-Segment. FCA leads in the A-Segment by far. The B-Segment is quite balanced between VW, GM and FCA. Japanese lead in the C-Segment thanks to the Corolla and Civic. Upper segments are extremely rare in Brazil. 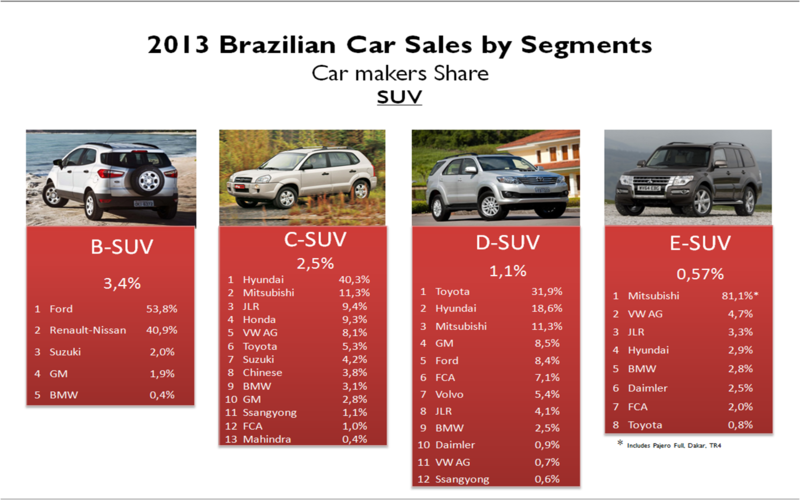 SUVs are still unpopular in Brazil despite the fact that small ones are becoming more and more known. The Ford Ecosport allows Ford to clearly lead in the B-SUV segment. The Duster is also popular. Asian brands dominate in the upper segments. The MPV segments are mostly controlled by Fiat thanks to the Idea and Freemont. Nevertheless the Honda Jazz is some how popular in Brazil. 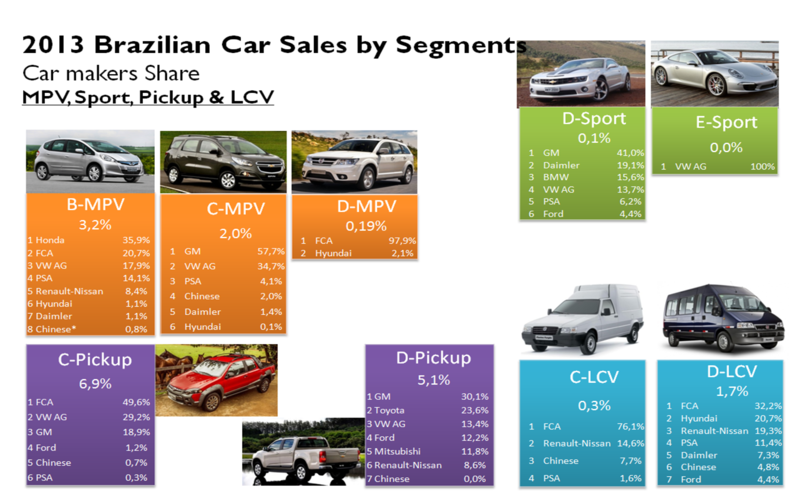 The Pickup segment counts for more share than all SUV segments together. Here FCA clearly wins in the small segment, while GM and Toyota lead in the larger pickups. Due to high taxes, it’s quite difficult to see sporty/high performance cars in Brazil. FCA leads in 3 out of 5 major segments. 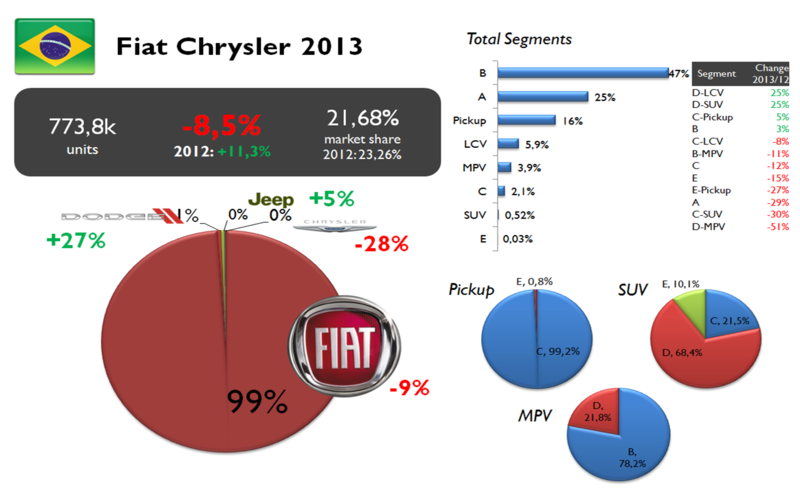 The passenger segment is very balanced between Fiat, VW and Chevrolet. It is the same scenario for the pickup major segment, where the leadership is in Fiat hands but GM and VW aren’t far. Ford dominates in the unpopular SUV segment thanks to the Ecosport. Chinese brands have some relevance in the MPV and LCV segments. The Plus sub-segment is composed by those small cars that are priced at higher levels. The latest Gol generation makes part of this segment and controls, along with the Voyage and Polo, 35% of the B-Plus segment. Due to lack of data, it is not possible to split the Fiat Siena sales (the Grand Siena would be part of the B-plus segment). Premium segment is very unpopular as these cars are very expensive. This may change in the coming months with the arrival of BMW local production. Compact SUVs are the most common premium cars on the roads (after D-Segment). 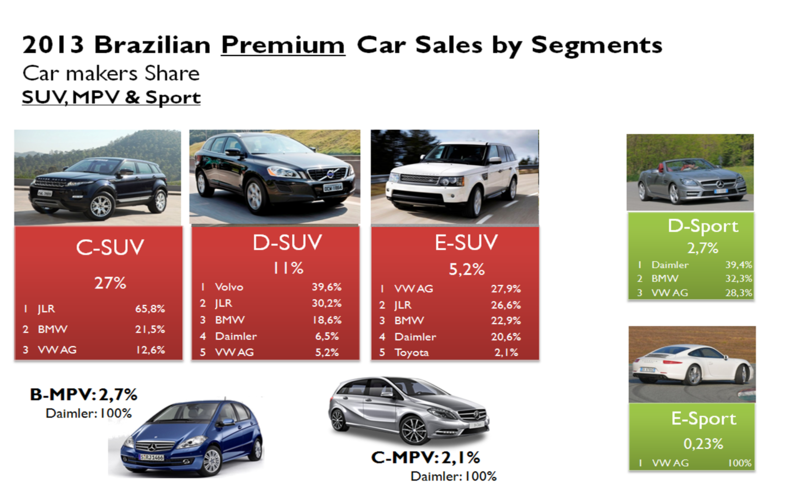 Brazil is one of the few markets where JLR leads in the premium SUV segment. Thanks to the Evoque, the brand occupies the second place in the premium market, ahead of Mercedes and Audi. 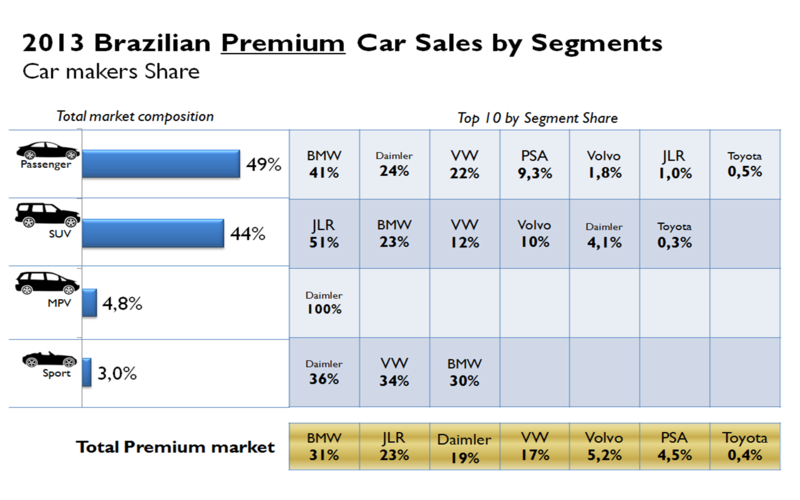 I’m not 100% sure, but, when a automaker has a factory in Brazil, they have a big discount in imported vehicles (not sure, but probably has a limit of cars to have this discount), which will make the 3 germans very aggressive in up coming years, specially in a lower segment that is being availed by the germans (A3 sedan, BMW 318 and the new Mercedes). 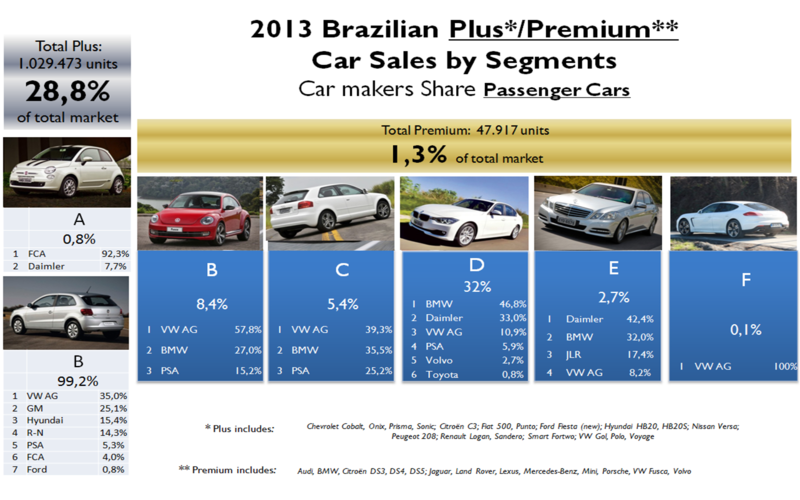 Premium car makers are now pointing at Brazil to build locally. 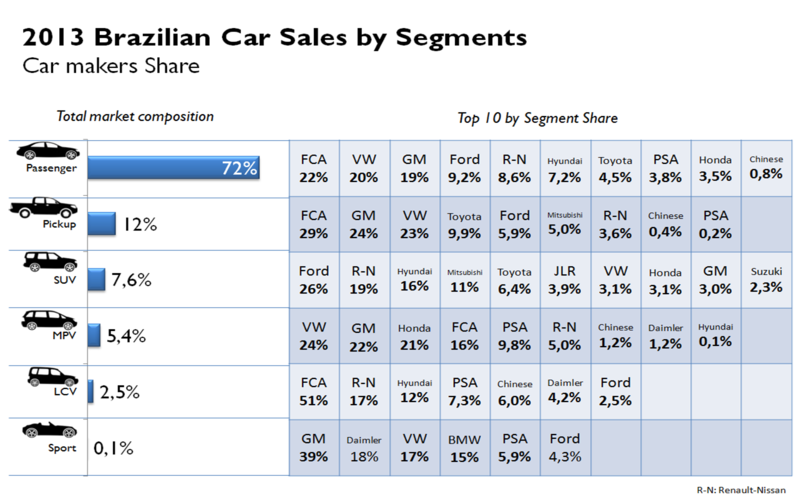 The thing is that Brazil isn’t as competitive as Mexico in terms of international trade and infrastructure and Brazilian premium car market is still very very small. But my point still, with a factory here, the germans will have advantages to IMPORT expensive cars gaining more discounts in taxes, discounts that consumers will never see… so more money for them.